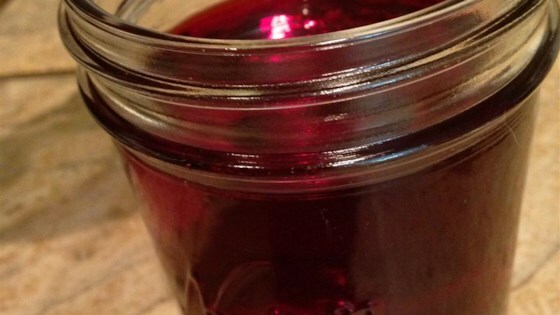 "It's extremely easy to make homemade grenadine. It's a two-ingredient operation. Your cocktails will thank you." Pour sugar and pomegranate juice into a sauce pan and warm over low heat, whisking continuously until the sugar dissolves. Cool, pour into a bottle or jar, and store sealed in the refrigerator. See how to make fresh jams and jellies from scratch—in just 30 minutes! The real deal! I used fresh pomegranate juice. If you read the ingredients list of grenadine, you will shiver. Use this splendid mix of natural ingredients. You’ll be happy you did. I'm surprised that pomegranate juice made this taste just like grenadine, which is mixed berry. :) Loved it, so easy, and thank you! Our favorite thing to make with grenadine. Shirley Temples. This has replaced the standard grenadine at my bar. We have not had a problem and it saves us money.